Home Books What Do You Do With An Idea? Ideas can be wonderful, especially when they come to fruition. 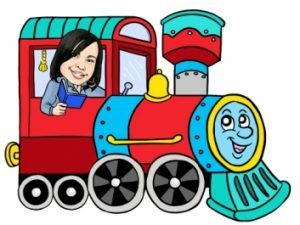 But what do you do when you’re a little kid with a BIG idea? Do you embrace and nurture it, or do you hide from it? 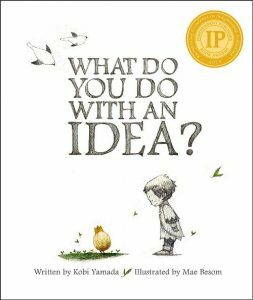 Author Kobi Yamada explores this familiar scenario in his outstanding 2013 picture book, What Do You Do With an Idea? 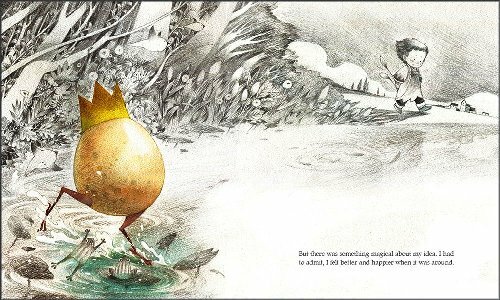 In the book, a young boy is suddenly confronted with a BIG idea that presents itself in the shape of a tiny golden egg with legs. Like most great ideas, it pops up out of nowhere and proceeds to stalk the boy’s thoughts and follow him everywhere. The boy asks the idea what it’s doing there, but it doesn’t answer — perhaps because it wants him to discover that the answer to the question is in him. But like so many people do, the boy feels awkward about the idea and isn’t sure how other people will react to it or what they will think of him. In the end, he opts to keep it to himself. Thankfully, he soon begins to believe in his idea and finally gains enough courage to embrace it and imagine its vast possibilities. This is a wonderful “sleeper” that breaks the creative process down to its most primary level, then brings it to life in picture book form. 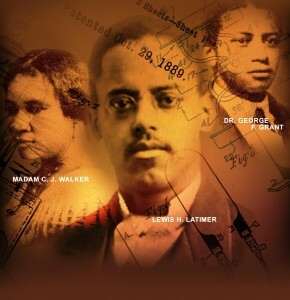 The prose is practical and clear, and is written in 1st POV to give the reader a comfortable, chummy, “you-know-what-I-mean” experience. Artist Mae Besome’s illustrations are done up in soft, consistent gray tone or pencil, which denotes the “gray areas” that exist while an idea is being nurtured and tweaked. But each page turn includes more color as the boy comes to embrace the idea, which suggests its evolution from unwanted guest (of sorts) to a welcome addition to the world of possibilities. Use this lovely book to spark creativity in any art, language or reading class. It can also be used as a catalyst for discussions about ideas, where they come from, and how to nurture them to fruition. A variation of this review appears on this url – http:// picturebookdepot.com/2015/ what-do-you-do-with-an-idea/. Next articleWhat Do You Do With a Problem?